Walking down the street in Rapid City, South Dakota. Accidental Ukraine Street View images from Tyachiv Beach walker Walking frame for a little dog Uruguay is now on Google Street View! Taking his rifle to the gun shop to get it fixed so he can go hunting? It’s illegal to carry your weapon out in the street being unpacked like that. So the only one explanation is that the guy is about to kill someone… If he was about to fix the gun, it would be properly packed. going to get his Harley Davidson back from the guy that took it! It’s a TOY GUN!!! Anyone with any sense would see the huge air canister on the bottom. It’s either a TOY BB Gun or an Airsoft gun. It’s not a real gun, although it wouldn’t be illegal in South Dakota to carry a real gun. It’s called the 2nd Amendment. 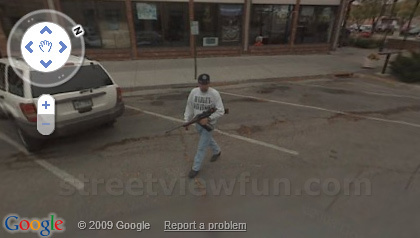 He is probably walking out of a gun shop to his car. Either he just bought the gun, or was getting a scope mounted or something like that. It is perfectly legal to walk out to your car with a gun without putting it in a gun case. But its more interesting to assume he’s going on a crime spree. I think you mean, Being a Russian. Guys, I live right down the street from here. He is walking to his car from a gun shop on the corner. It’s perfectly legal here is SD to carry your gun like that as long as it isn’t loaded. (Yes the clip is in, but probably empty.) It’s so common here that it doesn’t even bring a second thought. Leva – you’re an idiot. It is NOT illegal to carry a rifle openly on the street in many states in the US. Just because your liberal cesspool of a state is paranoid and doesn’t trust its citizens with weapons doesn’t mean the rest of the country is like that. @bestimmt As always, it’s the conservative who resorts to mudslinging.